After several resounding slaps and a liberal dose of smelling salts I recovered my senses, yet the vague sense of dread has never really departed. Bergman is one of the shining lights of 20th century European cinema, and if they are going to choose a team to remake The Seventh Seal I’m not sure it should include Nic Cage and Ron ‘The guy from Hellboy’ Perlman in front of the lens and the director of Swordfish and Gone in 60 Seconds, Dominic Sena, behind it. This big budget artistic abortion is set in the 14th century and sees Cage and Perlman star as warring Teutonic Knights not averse to teaching the godless savages of Asia Minor a thing or two about Christian chivalry. They partake in multiple Crusades and slay countless heathen foes over a number of years, yet for some reason are appalled when during one particularly bloody battle there is some collateral damage in the form of a dead female or two. Instantly repenting of their bloody past, the newly sanctimonious mass murderers head home to a land ravaged by the Black Plague. In a spot of bother over the whole ‘renouncing of God’s mission’ debacle, they are commanded by an ailing Cardinal (Lord of the Ring’s Christopher Lee) to deliver a young woman accused of witchcraft to a distant abbey in order that she can stand trial. The mission is dangerous, the hair is long and unkempt and the journey itself is a harrowing one replete with wolves, curses, demons and plenty of clichéd sentiment (‘Prayer is our only hope now’). The Seventh Seal is a cinematic triumph of the highest order, in which questions such of mortality, morality and the meaning of life are dealt with in eminently intelligent fashion amidst an artful backdrop of unforgettable imagery and incomparable directorial prowess. 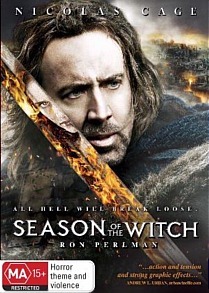 Season of the Witch, on the other hand, is a film in which Nic Cage staggers around in a Kurt Cobain wig and priests drop zingers like ‘I think we’re gonna need more holy water.’ The film currently holds a 6% fresh rating at Rotten Tomatoes and wowed neither audiences nor critics, but it does have a couple of positives. Perlman is typically excellent as the deadpan sidekick, putting in another adroit and subtly wry performance, and the lovely Claire Foy likewise proves no slouch as the sassy spellmonger forced to do most of her acting in bad makeup whilst cooped up in a cage. Ultimately however the film is too contemporary in its execution, and in the way the characters jive and wisecrack as they slice and hack reeks more of a buddy cop comedy than an authentic depiction of an age in which people literally reeked. It’s yet another misfire for Cage, and though it contains some enjoyable (if anachronistic) exchanges is a film that should probably be avoided like the Black Plague. The film makes extensive usage of special effects, which are a bewildering blend of adept and inept. Sometimes the CGI looks entirely convincing, other times it appears as though Cage and his cohorts are traipsing through a mid-level sword and sorcery RPG. On the whole the anamorphic 16:9 transfer is intentionally dark, but it’s never gritty and the picture quality itself is sharp. The DD 5.1 surround audio is potent enough, though directionality is somewhat limited and Atli Ovarsson’s score never really soars as it should, and there are descriptive narration and descriptive subtitle options available also. Season of the Witch might well be the only film I’ve ever seen which is eclipsed in every conceivable sense by the trailers which precede it. Then again, these are some pretty good trailers, touting the adrenaline-soaked newies from Jason Statham (The Mechanic), The Hangover’s Bradley Cooper (Limitless) and horror-comedy stalwart Wes Craven (Scream 4). Also included are eight Deleted Scenes, including an unrated and slightly more gruesome prologue, and a theatrical trailer.